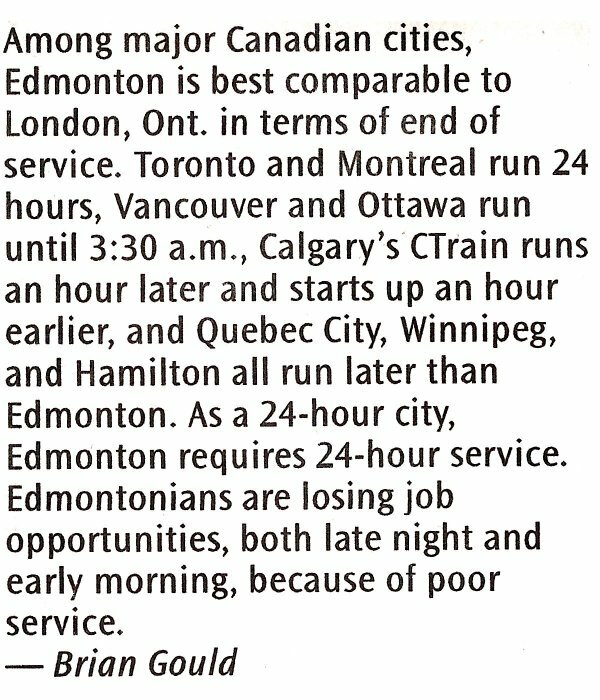 With this late night transit update, the Transit Riders' Union of Edmonton continues our campaign for 24 hour transit. Our passenger count along Whyte Avenue on New Year's Eve shows that the Route 4 bus gets significantly busier after ETS normally shuts down. 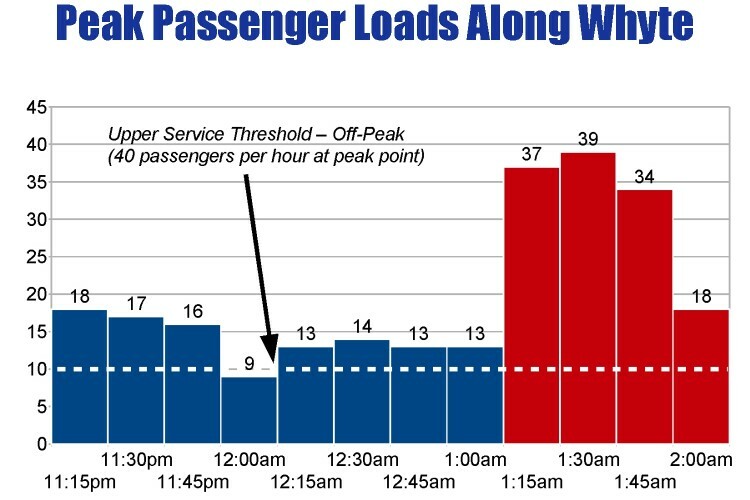 Peak loads are twice as high after the bus would normally stop running as before, reach the seated capacity of the buses, and are four times the upper service threshold. Clearly, the demand exists from recreational users alone, but as always TRUE is most concerned with the impact on workers who are forced to spend half a shift's earnings on taxi fare � both late at night and early in the morning. 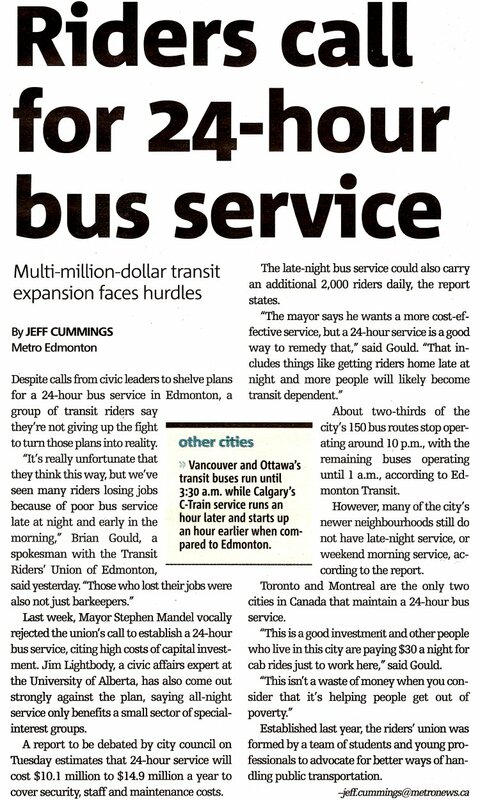 One year following Edmonton City Council's receipt of the relevant administration reports, there has been no visible movement toward extended ETS service hours, to the frustration of the thousands of supporters of our campaign. Attached to this update is the relevant section from TRUE's ETS Growth Strategy and Planning Review Shadow Report circulated in July 2008 which demonstrates the ongoing cost to transit riders of continuing to fail to provide this much needed service. In January 2008, two reports were presented to city council on extending late night service hours to as late as 3:30am or even 24 hours. These reports are available on the city's website, or here: 24 Hour Service Extend to 3:30am. TRUE supports extending transit service to 24 hours, as do the vast majority of transit riders we have spoken to. At our December general meeting, TRUE decided this was a priority project. We sent a representatives to speak at the meeting, wrote letters to council and newspapers, and issued a press release with policy research and a group TRUE position. 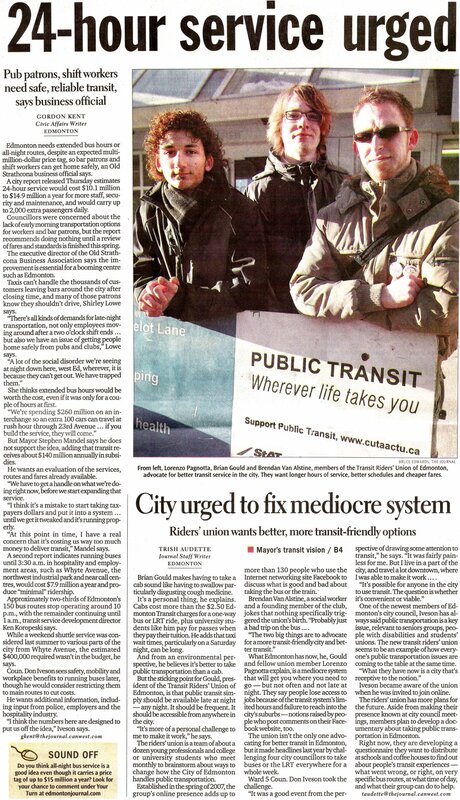 We again spoke in July 2008, and are continuing to campaign for 24 hour transit with this late night update. These reports were first reviewed at the Transportation and Public Works meeting on Tuesday, January 22, 2008. So what happened at the first meeting? TRUE and delegations from the NAIT SA and the Old Strathcona Business Association along with University of Alberta students presented. The issue was again delayed (the 3:30am report was already postponed from Fall 2007) to May or June, when it will be considered along with a number of other transit issues, including cost recovery. TRUE based its presentation on quotes from transit riders, and spoke about the social, safety, and economic benefits of 24/7 service. Our delegation also stated that the need for 24/7 service isn't sometime off in the future, but right now. Bob Boutilier, transportation manager for the City, said that he no longer thinks 24/7 service is a matter of "if", but instead a matter of "when" and made a presentation in which he outlined two options for late night service. The first was the expansion of late night service as it stands (all the routes running after 10pm will continue to run until 5am in the morning). The other option was skeleton service which would comprise main line routes 1-15 and wouldn't include late night neighbourhood routes. Members of NAIT's Student Associaton spoke, asking for better late night service to NAIT. 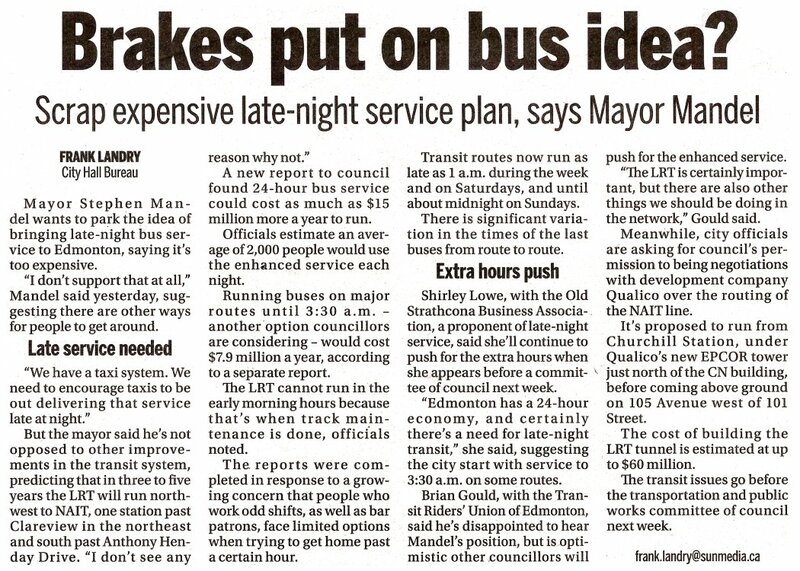 And while Late Night Service is not intended to address the buses that run between 6pm-10pm, these members asked that evening service in the NAIT area is also considered for improvements. Mrs. Lowe of the Strathcona Business Association then spoke, and made several points in favour of 24/7 service, and suggested perhaps a bus that takes people from Whyte Avenue to other major transit centres (University, Downtown, Millwoods, etc.) She also expressed that since Whyte Ave is close to the University and because many students frequent Whyte, she feels the concerns of students are her concerns as well. She said that 24/7 service is a decade overdue. Dave Cournoyer and company presented from a University of Alberta student's perspective, including asking how students can access the 24 hours study space in SUB if there isn't 24/7 bus service. Bryan Saunders spoke last, reiterating that Edmontonians have waited long enough for this, and that there are many non-financial benefits to 24/7 service: it would help the labour shortage (in industry, hospitals, and with cab companies), policing costs may go down; deaths due to drunk driving and violence may go down, and it could even make housing more affordable for many. He also noted that the report appears to underestimate 24 hour ridership at only 2000 people, which does not take into account trips made outside the late night period as the other half of a return trip, trips outside the "overnight" period, nor gains in transit dependency. There were no speakers who said anything against expanding ETS service hours. Ten councillors were present for question period (only four are actually part of this particular committee), showing that council is taking this issue seriously. Mayor Stephen Mandel, and Councillors Linda Sloan and Ron Hayter were not present. TPW Chair Bryan Anderson moved to table the reports and discuss again with a vote when a new ETS report is due, inviting the delegations to speak to Council again about why we need 24/7 service. This new report yet to come out addresses not only 24/7 service, but many many other ways that ETS service can be improved. The motion to table passed. Councillor Leibovici then asked if the report being prepared addressed the possible social, economic and safety benefits of 24/7 service or just the financial ones. Bob Boutilier replied that it just addressed the financial ones. (Leibovici and Iveson?) both asked that the other issues be considered as well, as these are important issues. Indications are that the earliest we can expect to see extended service, if the motion passes, is the beginning of 2009, once it is incorporated into the new budget (the 2008 budget has already been set in stone). It currently seems plausible that the motion will pass; however, that may only be the 3:30am extension. TRUE will be working on more general recommendations for the overall report this spring; however, we will continue to advocate for extended service hours. 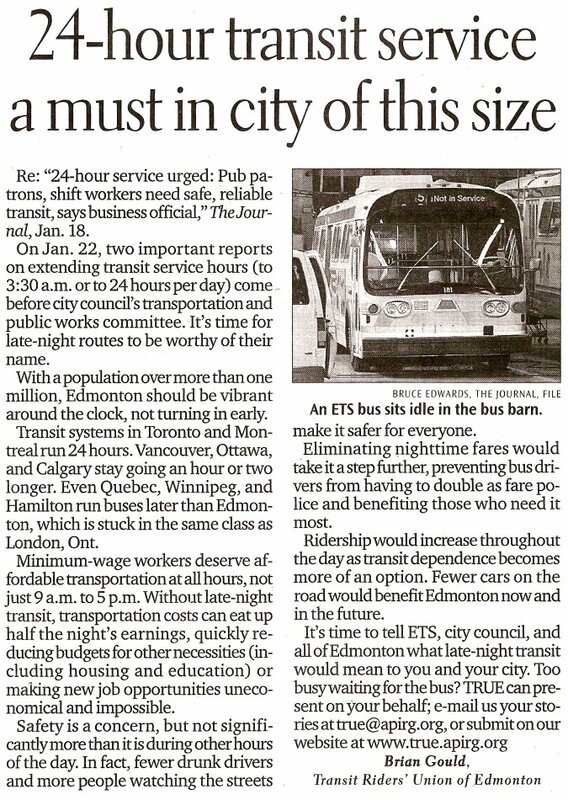 We are very interested in all members' thoughts about late night transit. How does the current service meet your needs? What would you like to see come out of this? Do you have any special stories, experience, or statistics to bring to the table? Have you ever lost jobs or been impacted in other ways because your bus stopped running too early? Please take the time to write about your experiences in the box below. Responses don't have to be long, and the more quotes we get from different people the more powerful the message. If you would be interested in compiling any of the writen material, researching late night transit in other cities, or presenting, please let us know.